Oh my. 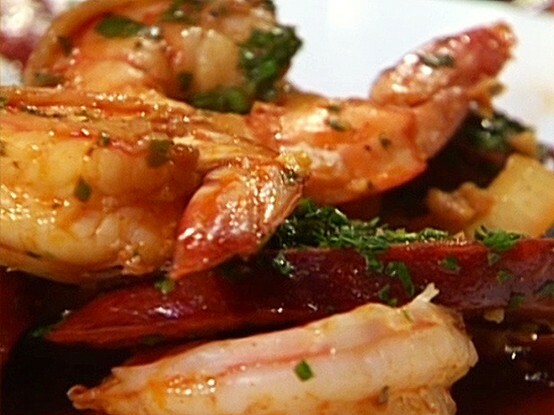 I was on Pinterest and came across this pin of a Shrimp and Chorizo Tapas...turns out to be an Emeril Lagasse recipe. I'm a big Chorizo fan - so spicy and rich - and love shrimp with spanish spices... so this is very exciting. So much I had to share. In a large skillet or cazuela, heat 1 tablespoon of the olive oil and saute the sliced chorizo until it begins to brown around the edges, 7 to 8 minutes. Add the onion and cook, stirring occasionally, until they are caramelized around the edges and softened somewhat, 4 to 6 minutes. Add the garlic and cook, stirring, for 1 minute. Add 1/4 cup of the sherry and cook for 1 minute. Add the shrimp, paprika, 1 teaspoon salt, and 1/2 teaspoon black pepper, and cook, stirring occasionally, until pink and cooked through, about 4 to 5 minutes. Add the remaining 1/4 cup of sherry and 1/4 cup olive oil, lemon juice, parsley and remainder of the salt and pepper; stir to combine and remove from the heat. Serve immediately, on small plates with any accumulated cooking juices spooned over the top. Pass the bread at the table.